This fun, colorful school parking permit sticker is the perfect way for you to identify the vehicles of your staff and students. And the best part? You can totally customize it using our online sticker maker! Simply change the colors, replace the text to reflect the name of your school, and choose the number range that’s right for you. You can even upload your school’s logo or mascot! 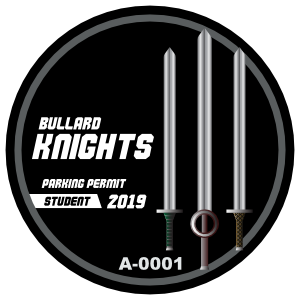 Getting a high quality, custom parking permit sticker for your school has never been easier.